"Trying to sneak a pitch past Hank Aaron is like trying to sneak a sunrise past a rooster." This was the one week when our family could attend Emma's soccer game in the a.m. and still make it to Cam's baseball in the afternoon! Emma played defense in the match and her buddy, Cam, cheered her on excitedly from the sidelines shouting "Yay Emma!" and "Emma Yay!" After a quick lunch and some added sweatshirts, we all headed out to the ballpark. The league has had something unique for each game day- this Saturday, we were greeted by our minor league team, the Whitecaps! The players volunteered their time to help out with the game and happily posed for pictures, mascots included. It was a bit chillier than we all would've liked, but the fans had a warm welcome for the players. Cam had a big contingency of cheering spectators from relatives and best buddies. Karen drove all the way from Chicago to be in attendance and proudly wore a purchased sweatshirt in support of the league. Aunt Joyce, Uncle Joe, Aunt Gay and cousin Mike drove in from Montague to watch Cam play ball. And our dear friends and forever neighbors- Patti, Anna, Megan and Emma kept us dry with multiple umbrellas! 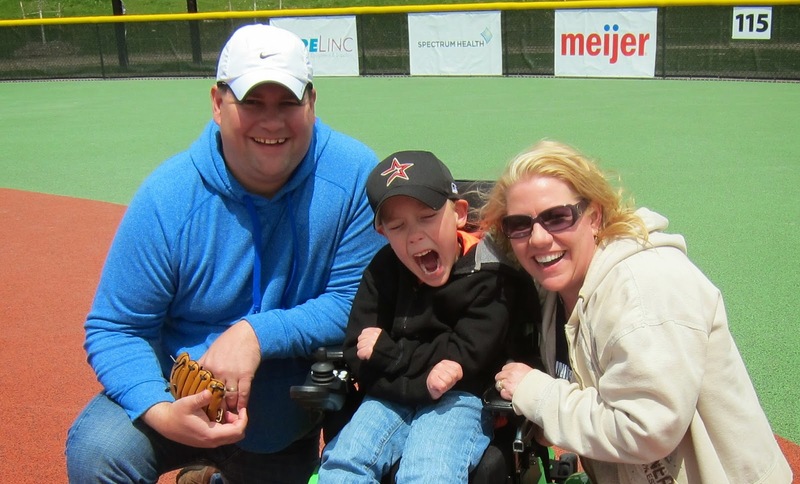 With each baseball game, Cam seems to gain more confidence with his overall playing ability. We have gained more fans whom we cannot thank enough for providing Cam with an extra large cheering section in the stands! Welcome to Cameron's blog. It was created and launched in August of 2007 when Cam was born. The original intent was to provide progress notes when Cam was a baby, however, it has continued to be updated on a weekly basis since. The blog is dedicated to Cam and highlights some of the adventures of his exciting life. Chris and Jane Weatherford are very proud of their son and want to share his great stories with him every week. The entries are written by Cam's mother. You can subscribe to the blog here to get notification when it's updated. You can also comment at the bottom of any posting to leave feedback for Cam and his parents. Please continue to visit the site to follow all of the activities of Cameron Weatherford!